Andi's step-mother is a real piece of work! But is Ruby a murderer? Andi Anna Jones, so-so travel agent/amateur sleuth, puts aside her resentment of her father's widow and books a 60th birthday cruise to Cancun for Ruby and three friends. Never does Andi imagine the cruise will lead to the murder of a has-been lounge singer--or that Ruby will be the main suspect. Flirting with more than danger after arriving in Mexico, Andi connects with the charming local sheriff, Manuel Rodriquez. After an embarrassing night involving the sheriff, too many margaritas, and a Mariachi band, a chance to check out an eyewitness to the murder leads her to Las Vegas. In Vegas, a mysterious meeting in the Bodies Exhibition, a body preserving in the prep-room, and an evasive owner of a dance studio, give Andi clues to help Ruby. But when Andi is mercilessly drugged and locked in a storage room, she realizes dear old step-mom isn't the only one in jeopardy. 1) As a travel agent, you must love travel. Where are your favorite places to go? Really? You assume I love travel? I suppose that’s a popular misconception about agents. Actually, I get so sick of hearing customer complaints, personal travel is about the last thing I want to do! And, crowded airplanes (I’m a severe claustrophic! ), airports, and lost luggage? Forget it! Well, unless it involves a white sand beach in Cancun, a handsome sheriff, and a pitcher-full of margaritas. On second thought, travel can be pretty cool! 2) How did you find yourself as an amateur sleuth? I’ve always been interested in “sleuthing”. I watched Matlock, Murder She Wrote, and Columboreruns while other kids my age were glued to cartoons! I was, however, forced into action when my annoying stepmother (Dad’s widow), found herself in a sticky situation in a foreign country. Since my dad made me promise to look after her when he was gone, I was pretty much stuck. Especially since my sister, Georgia, was no help at all! 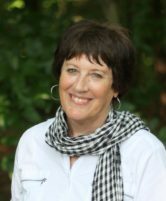 3) If you could say anything to your author, Mary Cunningham, what would you say? I’d tell her to stop putting me in all these precarious situations! White sand beaches and plenty of food and drink are all I need. Well, that and a gorgeous companion to share it. I’d also tell her to make me sound a little more confident, add a Wonder Woman body, and let me wake up in the morning with perfectly “coiffed” hair and fresh breath. 4) Do you have any romantic interests? Not at the moment, unfortunately. I do have a long-distance “friend” I Facetime now and then. He has relatives in Miami, so whenever he finds the excuse to visit, I find the time for him. I’m just not sure I want to settle down and, so far, he hasn’t asked. 5) What are some of your hobbies? I love cruising A1A in South Florida in my vintage Mustang convertible. Feeling the wind in my hair and smelling the salt air rejuvenates my spirit after a tough day at the agency. Being a Florida native (one of the few), I’ve always been a beach gal and my unruly hair and mass of freckles proves it. I also love non-participation sports like watching my beloved Miami Dolphins. 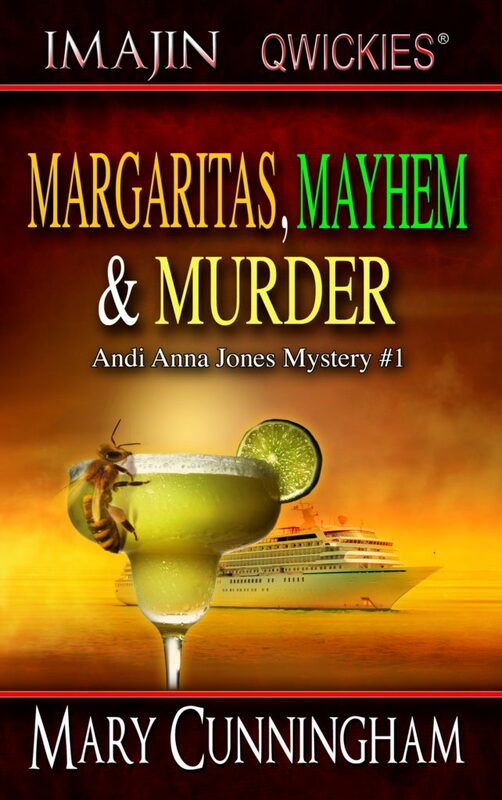 Margaritas, Mayhem & Murder by Mary Cunningham is the first book in the Andi Anna Jones mystery series. Andi is a travel agent (via an inheritance) and finds herself having to travel to Mexico to bail out her former stepmother, Ruby. Andi set Ruby and her friends up on a cruise, only to have Ruby tangled up in a murder and needing her help. This was a super fast read. Because of that, there were some parts of the story that seemed to jump around or come out of nowhere. A couple of times, I found myself flipping back a page just to make sure I hadn’t missed something. The romance to me felt a bit rushed and not at place in the story. I think this is only because the story is short enough that there didn’t seem to be enough time or appropriate circumstances to develop a romance along with a mystery. I am really interested in this book. Sounds good, I like fast reads. Thanks for the giveaway and the review. This is from Imajin Books “Quickie” imprint (novella), and it is a fun, fast read! Thanks for visiting! Awesome! I love a good mystery. This is a good mystery with some humor and quirky characters to go with it. Thanks! Had an idea just like this once, only EllieAnna Jones after my daughter Ella. We’ll have to check this one out – thanks. Thanks for the post. I like a good mystery. Thanks, Robbie. Now available in paperback, too. Brooke has an awesome blog! I love finding a new author and a new series….Sounds right up my alley! Thanks, Joanna! Book #2 is in process, too! Looks like a good read. I look forward to reading this! Love the title and cover! Looking forward to reading, sounds like a great read. Sounds like a good read. I’m looking forward to reading this!